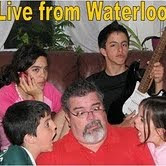 Live from Waterloo: And we still made it through the border! And we still made it through the border! Customs Lady: How long have you been in the US? CL: You travelled all the way to DC and you’re back just one day later? Why did you go there? Gaby: It was my birthday! Gaby (starting to notice how silly we sounded): Well, we just wanted to spend my birthday with our family. Me: Yes, my brother and his family live down there. CL (almost giving up): Did you purchase or receive anything? Gaby: Well, I got a plant from my sister-in-law, but it was a birthday gift. CL: That’s it??? You didn’t purchase anything else? Me: Nope, just gas and food for the trip. CL (still incredulous): Nothing else, no alcohol, nothing at all? Me and Gaby then suddenly realize that we have a box containing 24 bottles of beer in our trunk, which I bought for a friend, so we exclaimed in unison: Oh, yes, the beer!!! CL (as if we didn’t know): I did ask if you have purchased anything, didn’t I? Me (with my dumbest possible face): Yes, I know, I completely forgot about the beer I bought. Sorry, it’s just that I don’t drink. Gaby: And incidentally… we left two of our children at my brother-in-law’s place in Washington DC. They’ll be coming back on Friday. CL: Go. Just go. Welcome to Canada. Señorita en la Aduana: Cuánto tiempo han permanecido en US? SA (extrañada): Cuándo salieron de Canadá? SA: Viajaron hasta DC y volvieron un día después? A qué fueron??? Gaby (comenzando a notar lo extraño que sonaba todo): Bueno, queríamos pasar mi cumpleaños en familia. SA (casi rindiéndose): Compraron o recibieron algo durante su estadía? Gaby: Bueno, mi cuñada me dio una plantita, pero fue un regalo de cumple. SA: Eso es todo??? No compraron nada más? SA (todavía incrédula): Nada más, nada de alcohol, nada de nada? De repente Gaby y yo nos acordamos de que yo había comprado una caja con 24 botellas de cerveza para un amigo, las que estaban en el baúl, y exclamamos al unísono: Oh, sí, la cerveza!!! SA (como si no supiéramos): Les pregunté o no si habían comprado algo? Yo (con mi mejor cara de idiota): Sí, ya sé, me olvidé por completo de la cerveza que compré. Lo que pasa es que yo no bebo alcohol. Gaby: Ah, y a propósito… dejamos a dos de nuestros hijos en casa de mi cuñado en Washington DC. Ellos vuelven el viernes. SA: Vayan. Váyanse, por favor. Bienvenidos a Canadá. Ustedes sí que viajan por carretera!! I forgot about the beer. Oh yea, and the snake. A plant, some beer, and a large snake. That's not normal? Oh my gosh. I think that's the funniest conversation I've heard in a long time. I could even see the look of exasperation on that lady's face.